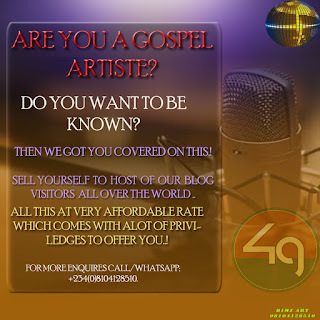 Home / EVENTS / NEWS / Are you a Gospel Artiste? Don't miss this & become your dream star today.! Are you a Gospel Artiste? Don't miss this & become your dream star today.! Call/whatsapp: +234(0)8104128510 or send us a DM via our mail (4wardgospel Tv : rimamstikiluka@gmail.com). Thankyou and we anticipate your ernest reply..! See you at the top..